Arrive at St. Pancras International Station where our Golden Tours representative will meet you at chop’d coffee shop, opposite the Eurostar concourse, at 6.00am (5.30am on Saturdays) where you’ll receive an informative welcome pack. Eurostar Check in closes 30 minutes before the train departure time. On arrival at Gare du Nord station please make your way to open top bus tour stop situated just outside the station, at 10 boulevard de denain: Eurostar et Thalys. Then it’s time to begin your enchanting day in the City of Love! Feel the buzz of the city as you cruise through the Champs-Elysees – a mile-long street flanked with luxury stores and charming cafes. 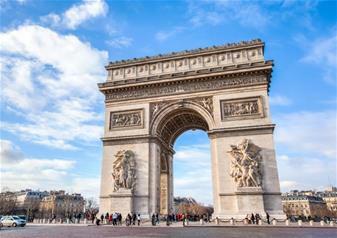 See the historic Arc de Triomphe standing in the centre of whizzing traffic, and hop off if you wish by the iconic Eiffel Tower. You’ll have to tear yourself away from Paris eventually, so arrive at the Eurostar check-in at Gare du Nord at least 45 minutes before departure. Your departure time from Paris is 8.13pm, arriving in London at 9.39pm. Entrance to the Eiffel Tower is not included.